The skin’s inventors say that when the “e-dermis” is layered on top of a prosthetic, it brings back feeling through the fingertips. “We’ve made a sensor that goes over the fingertips of a prosthetic hand and acts like your own skin would,” says lead researcher Luke Osborn, a biomedical engineering graduate student at Johns Hopkins University. “It’s inspired by what is happening in human biology, with receptors for both touch and pain. 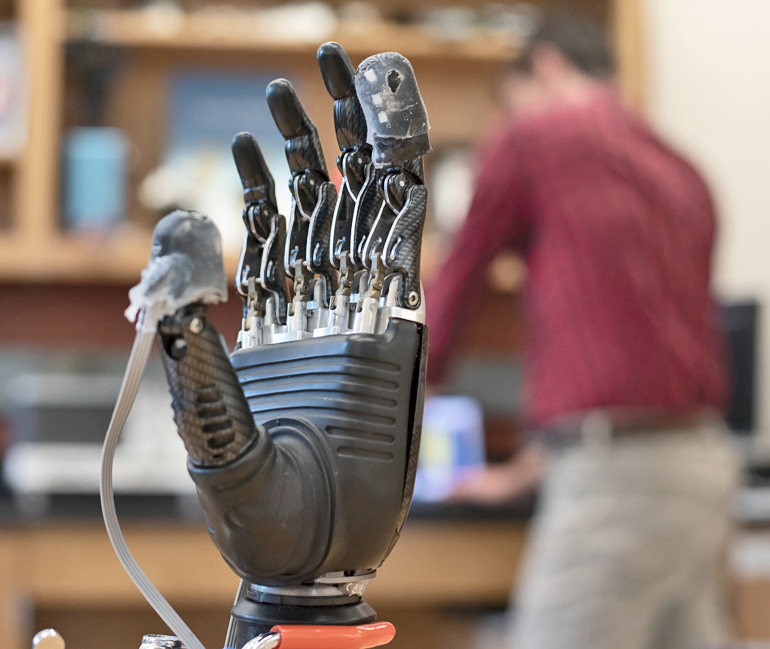 The work, which appears in Science Robotics, shows it’s possible to restore a range of natural, touch-based feelings to amputees who use prosthetic limbs. The ability to detect pain could be useful, for instance, not only in prosthetic hands but also in lower limb prostheses, alerting the user to potential damage to the device. That is where the e-dermis comes in, conveying information to the amputee by stimulating peripheral nerves in the arm. The device does this by electrically stimulating the amputee’s nerves in a non-invasive way, through the skin, says the paper’s senior author, Nitish Thakor, professor of biomedical engineering and director of the Neuroengineering and Biomedical Instrumentation Laboratory. “For the first time, a prosthesis can provide a range of perceptions, from fine touch to noxious to an amputee, making it more like a human hand,” says Thakor, cofounder of Infinite Biomedical Technologies, the Baltimore-based company that provided the prosthetic hardware used in the study. The researchers connected the e-dermis output to the volunteer by using a noninvasive method known as transcutaneous electrical nerve stimulation, or TENS. In a pain-detection task, the team determined that the test subject and the prosthesis were able to experience a natural, reflexive reaction to both pain while touching a pointed object and non-pain when touching a round object. The e-dermis is not sensitive to temperature—for this study, the team focused only on detecting object curvature (for touch and shape perception) and sharpness (for pain perception). The e-dermis technology could make robotic systems more human, and it could also expand or extend to astronaut gloves and space suits, Osborn says. Other researchers from the Johns Hopkins departments of biomedical engineering, electrical and computer engineering, and neurology, and from the Singapore Institute of Neurotechnology contributed to the work. Space@Hopkins, the Applied Physics Laboratory, and the National Institute of Biomedical Imaging and Bioengineering funded the work.